Baumann Park Lake is a heavily-used fishing spot for local fisherman. The former quarry’s sandy shoreline prevented much of the vegetation from growing along the areas of the shoreline accessible to fishermen. Even the most accessible areas were typically very steep. With a grant from the Illinois Environmental Protection Agency, Hanson Engineers, Inc. determined that the poor water quality of the lake was due to shoreline erosion. For environmental reasons, the park’s patrons requested a bioengineered approach to stop further erosion from occurring. Hanson Engineers, Inc. recognized early on that a strictly “vegetative” approach would not withstand the erosion caused by the constant buffeting of waves. 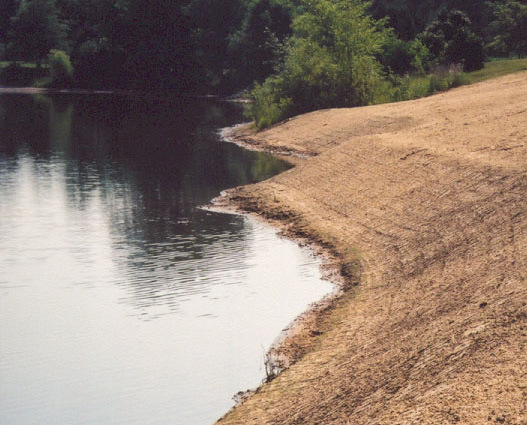 Plans were prepared to stabilize the shoreline and to increase the biological diversity of flora using some bioengineered techniques in conjunction with open cell ArmorFlex mats for maximum vegetation. A drought in 2001 prevented a successful germination, but after a reseeding in 2002, the shoreline has become a vast region of vegetative color.